There is a dry riverbed that splits Bucerias in half. At least it’s dry most of the year. Where the riverbed runs beneath the main highway it is covered by a bridge that is just high enough to let a good-sized pickup pass beneath and not much more. It is under this bridge that an old man stands everyday selling tejuino, an ancient drink that is as specific to Guadalajara as a torta ahogada. So it was no big surprise to me that once Carlos filled his belly with his drowned pork sandwich he’d want to quench his thirst with a tejuino. So we drove into Bucerias and slowly drove over the rutted muddy road beneath the bridge until we found Mr. Tejuino and his little cart. I’ve got to say that Carlos was pretty excited, although when I tell you what a tejuino is, you’ll wonder why. If you’ve ever gone to an authentic Mexican restaurant where they make their own tortillas, you will have seen a woman, usually older rather than younger and stout rather than slim, massaging a big ball of corn masa from which she will pinch golfball-sized chunks and flatten into tortillas. Well imagine that instead of frying the dough into a tortilla, the woman mixed it with water and piloncillo (the cone-shaped Mexican raw brown sugar), boiled it all up until it was thick as caramel and then allowed it to ferment in a big jug. 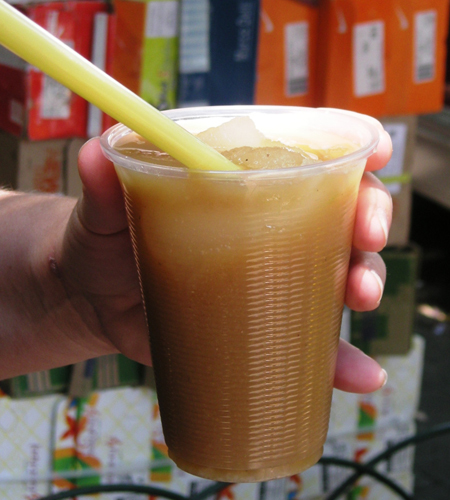 That, for the most part, is tejuino—sweetened and fermented tortilla juice. As far as Carlos was concerned, this wasn’t bad tejuino. It just wasn’t as good as the stuff you could get in Guadalajara, he said (everything is better in Guadalajara) where tejuino is “always, always, always served with nieve de limon”—lemon sherbet. Then what is it? I asked him. “It is something,” he said. “It just isn’t tejuino.” Then he pushed the plastic cup in my direction. “Would you like to try it?” he asked. “I never drink tejuino without the lemon sherbet,” I told him, though I don’t think he heard me as he was slurping the last of his drink through the straw. The menu board at Claudio's. Photo by David Lansing. I was reading Patti Smith’s memoir Just Kids where she talks about how a big treat for her and Robert Maplethorpe was to go to one of those luncheonettes they used to have in NYC where you’d put in 25 cents into a machine and get a cheese sandwich and maybe 10 cents for a carton of chocolate milk. She writes about this one time where she was really hankering for a cheese sandwich and she put in her quarter or whatever it was only to realize that they’d gone up a dime. And she didn’t have any more money. So this guy gives her a dime and maybe even buys her a cup of coffee as well, I can’t remember exactly how the story went, and she sits down with him to eat and it’s the poet Allen Ginsberg. But the funny thing is that Ginsberg thought he was picking up a cute, skinny boy. This young Patti Smith is so androgynous looking that he doesn’t realize that he’s a she. Anyway, I was just thinking of that story because I thought it was so interesting how Patti Smith and Robert Maplethorpe used to like to go to these luncheonettes. I mean, they knew the food was pretty horrible but, hey, it was cheap, and there was something very appealing and democratic about the crowd that ate there. Poor people down to their last two bits like them and businessmen in suits just wanting a quick easy meal and families who thought going there was a real treat. That’s the way Claudio’s is in Bucerias. Particularly on a Wednesday night. Claudio’s is this simple little place on the beach with a mixture of rustic furniture and a palapa roof and waiters who can take 10 minutes to get you a beer. 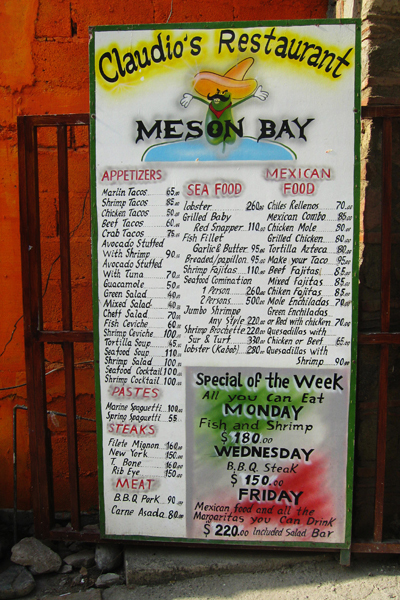 On Wednesdays it’s particularly jammed because that’s all-you-can-eat bbq night. They fire up the grill right there in the restaurant and cook up ribs and chicken and chorizo but the big attraction are the rib-eye steaks. For the equivalent of about $12.50, you can eat all the ribs and steak you want along with baked potato, pinto beans, salad, bread. The thing is, the food is really not very good. It’s not bad; it’s just not good. The rib-eyes are as tough and gristley as bear meat, the ribs are dry and flavorless, and the salad bar is just iceberg lettuce floating in a pan of water. There’s usually a couple of guys playing Jimmy Buffet-like music way too loud so it’s impossible to talk unless they take a break and there’s another guy who goes around with a camera and a sombrero trying to goad people into having their picture taken wearing the ridiculous hat so he can sell them a hasty print before they’ve finished their dessert. The waiters work very hard but there are so few of them compared to the number of diners that it can take forever to get your drinks and when you do, they’re almost invariably wrong. I usually order a Negra Modelo; they always bring me a Pacifico. If I ask for a small margarita, they bring me a large one; order one on the rocks and it comes blended. This is just the way it is. Still, everyone I know goes to Claudio’s. It’s like those old luncheonettes in New York; for some reason it’s appealing. This afternoon Vicky called me up and asked if I wanted to join her and a few friends for dinner tonight. Sure, I said. Where are you thinking of going? It’s not easy driving around downtown Puerto Vallarta. The roads are cobblestone and there are no lanes. It’s just a rush of traffic dashing in and out of openings in the traffic, sort of like an urban version of the Indi 500. Add to this cars that just stop in the middle of the road so the driver can run in and pick up a roasted chicken or the never ending parade of local buses that block lanes anytime someone wants to get off in front of this store or that one, the lack of stop signs and traffic signals, the kids playing in the street—well, it can be a little stressful to navigate. This was a low blow since I knew that Carlos’ grandfather, who lived in Guadalajara where Carlos’ family is from, had recently died. Okay, fine, I told Carlos. You look for a torta ahogada stand but you’d better give me plenty of notice if you spot it because I’m not going to just stop in the middle of the street like the rest of these drivers. 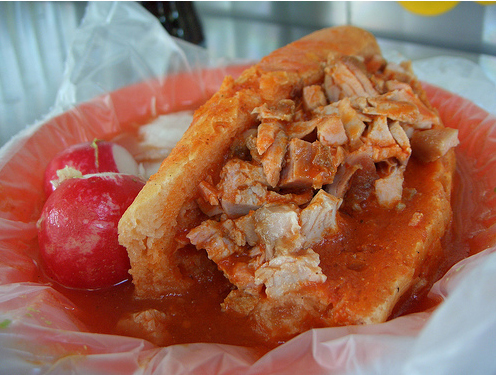 Frankly, I’d never had a torta ahogada, which is a Guadalajara specialty, but Carlos had been talking about them so much for the last few days that I felt like I’d grown up with them. According to Carlos, they are a favored Mexican sandwich made with a very hard roll, called a birote salado, which has a thick, crunchy crust but a soft, doughy interior. The roll is sliced in half and piled with fried pork and maybe some raw onions and chile peppers, and then drowned in a very spicy sauce made of arbol chiles, garlic, tomatoes and, most importantly, vinegar. Ahogada means “drowned” so when I say this sandwich is really dunked in this sauce, I’m not exaggerating. Ideally the entire torta should be submerged in the sauce. So anyway, we’re driving through Puerto Vallarta but Carlos is having no success finding a torta ahogada place. And then just past the airport, in a little strip of malls surrounding a round-about, he spots this little fast-food place advertising torta ahogadas. The only trouble is that I’m on the inside lane of three lanes of traffic and the entrance to the restaurant is ten feet in front of us. Nevertheless, I cut across the traffic, getting lots of pissed off looks and honking horns for my effort, and we make it. Carlos goes in and comes back a few minutes later holding a plastic bag that looks like something they’d give you at the pet store if you went in to to buy a dozen goldfish, except the liquid is a bright red and on the bottom, looking like a sunken toy submarine, is the torta ahogada. There’s no way we’re eating this in my car. So we stand in the parking lot, trying to figure out a way to gracefully dip a hand into the bag of fiery sauce and take a bite of the torta without having most of it dribble down your shirt, but there is no graceful way to eat ahogada so we just go for it, like a couple of stoners using our hands to rip into a chocolate cake. I thought it was pretty damn fine but Carlos says he’s had much better in Guadalajara. Of course. So now I’m thinking we may have to go on a road trip. To Guadalajara in search of the perfect torta ahogada. 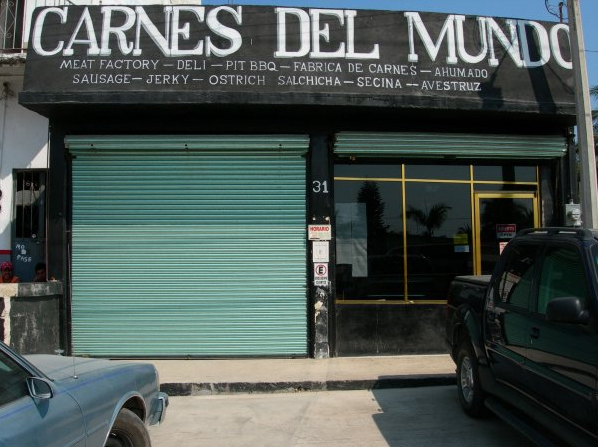 So for several days the Blue Whale has been at Gecko, which is a small little rental car agency just up the block from the butcher store called Carnes del Mundo which is probably the only place in all of Nayarit where you can buy guanciale, ostrich jerky, British bangers, and corned beef. It’s owned by Kyle and Irma and I don’t know what brought them to Bucerias or how they possibly make a living selling bratwurst and smoked tongue but then again I don’t know how the guy who I see every day walking up and down the beach selling candied apples for ten pesos makes a living either. Anyway, since I don’t have a car at the moment, I’ll walk along the beach into Bucerias, passing the candied apple guy and another guy pushing a wheelbarrow full of candy along the sand, until I get to the Italian restaurant on the beach, Mezzogiorno, where I take the little path up to the street that marks the northern end of Bucerias. And then I’ll walk several blocks past all the other beachside restaurants like Aduato’s and El Brujo until I come out at the plaza which is the center of town. Here there are many diversions, from the little shop selling paletas to the taco vendors across from the church to the guy that makes churros with caramel in the middle. And if it is hot and you do not feel like something sweet, you can always go into the mini-market and buy a cold beer and sit on one of the green benches in the park and watch the old men sleeping in the sun and the children chasing the pigeons. In short, there is plenty to do in Bucerias. Eventually I will walk up to the lateral road that runs beside the highway and go as far as the dry riverbed where the highway passes above a shallow bridge and cross over into the barrio and walk up the street to Gecko and ask Dennis how things are going with repairing my car and he will say fine, beautiful, they think they know what the problem is, that it is the rotors or maybe the calipers or maybe there is a leak in the master cylinder or perhaps it is something else completely and if they can just hold on to the car for a few more days, they should be able to fix it. This is what I have been hearing for several days now. And there is really nothing you can do about it. All it really means is that the mechanic has been busy with other work and he will fix your car when he can fix your car. You must be patient. Not being patient in Mexico is a great sin. So you thank Dennis for his time and ask him how the fishing has been lately, because Dennis loves to go out fishing for marlin or dorado more than he likes running a rental car agency, and he will tell you how many dorado he caught yesterday and tell you that you should go out fishing with him some time. “It’s very relaxing,” he says, and from the looks of him, I believe it. And then you walk further up the hill to Carnes del Mundo and say hello to Kyle and admire the thick, American-style rib-eye steaks in his upright freezer and maybe buy a coil of Cuban longaniza, though you’re not sure what you’ll do with it, and talk a bit about the Super Bowl, which neither of you saw or care about, and then you head back into Bucerias and down to the beach and spend an hour walking home where you slice up a bit of the longaniza and have it with a cold beer and congratulate yourself on having had a particularly busy and fruitful afternoon. I met my neighbors for the first time last night about eleven o’clock. Actually, they are renters in the unit next to mine—I have no idea who the homeowners are. But Libby and Don, who are from Canada or Wisconsin or someplace cold and white, knocked on my door just as I was about to retire for the night. They introduced themselves while standing four or five feet away from my door, the way people do when they want to make sure you understand they’re not home invaders, and asked if I might know how to light the pilot light on their hot water heater; or even if I might know where the hot water heater was. I grabbed a flashlight and went out into the hallway and showed them a little stucco-covered hut, about the size of a large dog house, with a couple of small-volume water heaters in it. The one on the left was hot and the pilot light was throwing off a pleasant glow. That was mine. The one on the right was as cold and inert as a homeless man sleeping in a doorway. That was the renters’. Don politely offered to hold the flashlight while I scrambled down on my hands and knees to take a look at the thing. Libby, meanwhile, stood back a few yards as if the rusty little cylinder might be an IED that I was foolishly trying to dismantle. This assumed, of course, that I did. Don went back inside and got some matches and a tapered candle and then stood several yards back from the water heater, his arm protectively around Libby to protect her from the explosion they obviously felt was imminent, while I tried to light the pilot light. But nothing was happening. I had a feeling the valve was broken and there was nothing to be done about it until tomorrow. “Well, you’re welcome to come over and use my guest bathroom,” I said, knowing full well they wouldn’t. Libby took a nice long shower and then shouted through the bathroom door asking if I had a hair-dryer and I told her to look under the sink and then listened to her blow-dry her hair for 15 or 20 minutes while I pretended to wash some dishes in the sink that I’d washed a few hours earlier, wondering how it was possible to work that long on hair that failed to reach beyond her ears. In any case, when she came out of the bathroom, shortly before midnight, she looked pink and cheerful and quite refreshed. I told her not to worry about it. And then I closed the door behind her and double-locked the door.